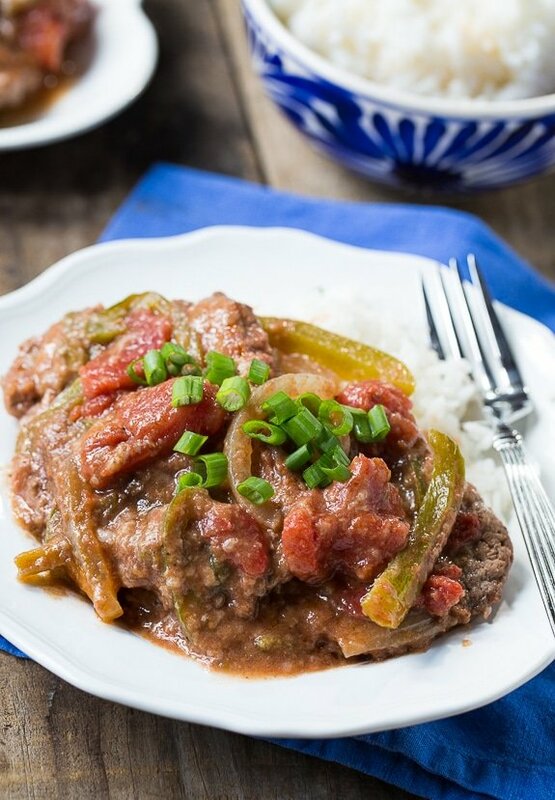 Classic Swiss Steak makes a hearty dinner any time of year. Cube Steak gets coated in flour and then browned in a pan. 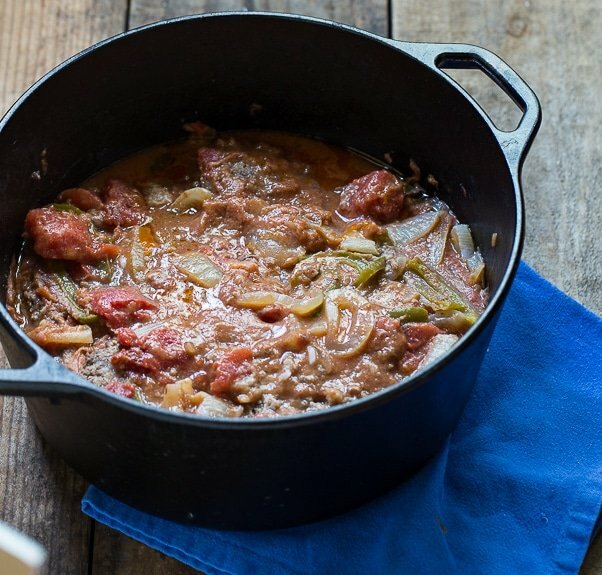 It’s slow-cooked with tomatoes, green peppers, onions, and seasonings until tender. Serve it over rice or mashed potatoes for a filling meal that won’t break the bank. I love using cube steak. It’s a great way to inexpensively put a protein on the table. It’s also delicious when made into Chicken Fried Steak. You could also use slices of round steak and tenderize them with a meat mallet. 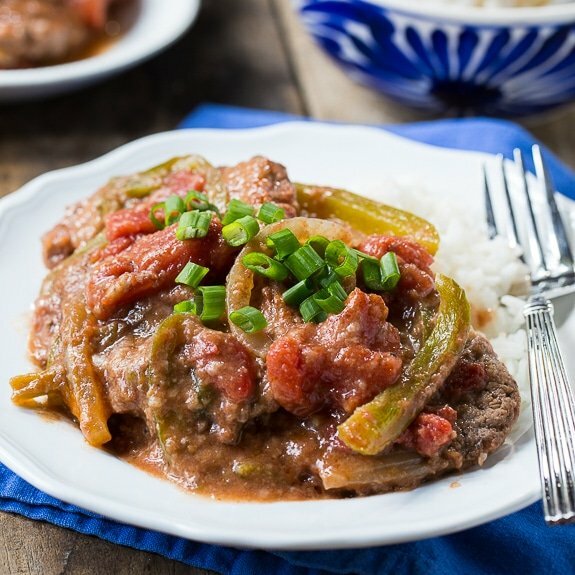 To make Swiss Steak, I cook a bunch of thinly sliced green peppers and onion in a touch of butter until soft. I remove them from the pan and set them aside so I can brown the cube steak, which I coat in flour, in the same pan. I like to use my Cast Iron Dutch Oven to make Swiss Steak. It is perfect for slow cooking because it heats so easily and retains heat well. Once the meat is browned, I add the onions and peppers back to the pan along with stewed tomatoes, a few beef bouillon cubes, some Worcestershire sauce, garlic powder, seasoned salt and pepper. It cooks for about an hour and 15 minutes. The meat becomes tender and all the flavors have plenty of time to blend. Old-Fashioned comfort food is always well received. Cube Steak gets coated in flour and then browned in a pan. It's slow-cooked with tomatoes, green peppers, onions, and seasonings until tender. Serve it over rice or mashed potatoes for a filling meal that won't break the bank. Melt 2 tablespoons of butter in a cast iron Dutch oven. Add onion and green pepper and cook until soft, about 5 minutes. Remove onion and green pepper to a bowl and set aside. Season both sides of cube steak with salt and pepper and dredge in flour. You want a thick coating of flour because it will help thicken the sauce. Add 2 tablespoons vegetable oil to Dutch oven. Working in 2 batches, cook cube steak until browned on both sides (it will not be cooked through). Leave the second batch of cube steak in the Dutch oven and return the first batch plus the onion and green peppers to the Dutch oven. Add remaining ingredients and stir to mix. Cover Dutch oven (I leave a little gap) and cook for 1 hour and 15 minutes over low heat, stirring occasionally to make sure nothing on the bottom burns. This entry was posted in Dinner, Main Dishes and tagged beef. Bookmark the permalink. 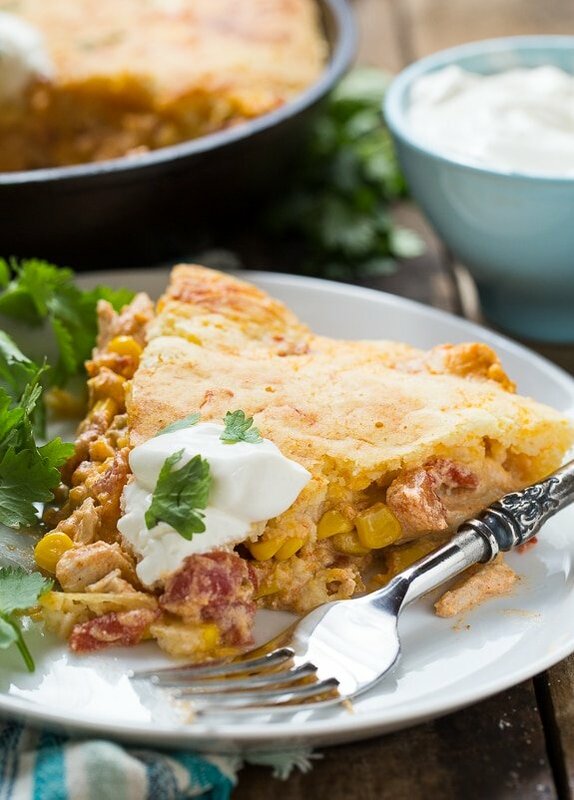 I am making this tonight, so excited!! So glad it brought back a happy memory for you Karrie! 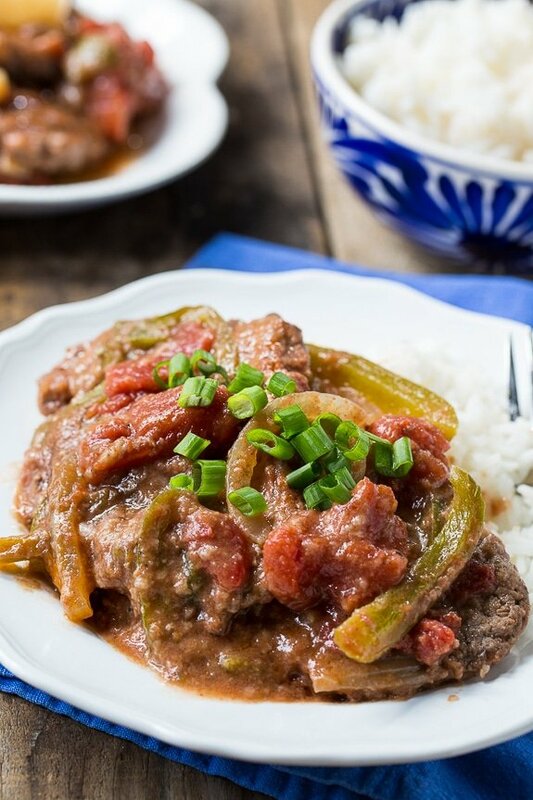 Mmm I’m craving this swiss steak for dinner, Christin! I’ve never made my own before, but that has got to change after seeing this recipe. I love how warm and comforting it looks! 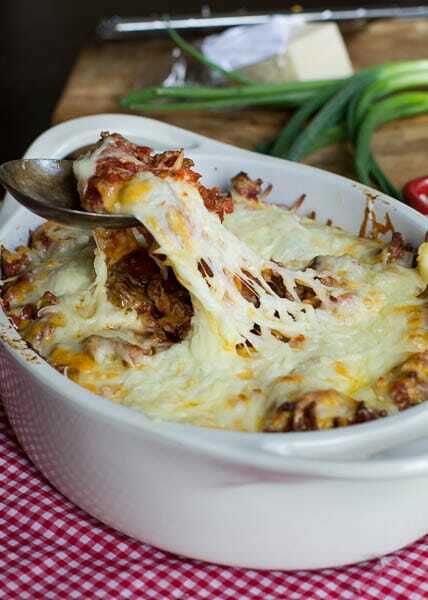 I love all of your classic, comfort food recipes Christin! This has always been one of our favorites! Oh I love this! Such great flavor too! This looks delicious, Christin! Love the flavours! This is definitely my idea of comfort food!